Now is the time to do it, before everyone who was there at the time is gone and the historian has to depend on dull old documents. As an archivist, I will refrain from taking umbrage with Dr. Shepard’s particular view of historical documents. I will, however, agree with Dr. Shepard’s assessment of the imperative of documenting history as it is in process and not waiting for a generation or more to pass in order to collect information. As part of the AHC History Project, we too believe that a full documentation strategy of the health sciences at the University of Minnesota requires not only the systematic collection of departmental records and the recruitment of the personal papers of well-known and accomplished faculty members, but also the recorded personal stories of key individuals who were involved in the formation of the AHC, served in leadership roles, or have specific insights into institution’s history. 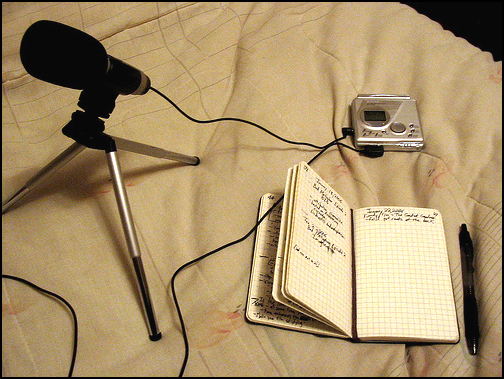 Our intent is to bring together a representative group of figures in the AHC’s history whose lived experience encompasses a variety of key topics and conduct interviews that will serve as high quality, well researched oral histories. To accomplish this task, the AHC History Project is pleased to announce the arrival of Dominique Tobbell, Assistant Professor for the Program in the History of Medicine and Oral Historian for the Academic Health Center History Project. Dominique received her B.Sc. in biochemistry from the University of Manchester in 2001 and her Ph.D. in the history and sociology of science from the University of Pennsylvania in 2008. Her dissertation examined the research and political strategies of pharmaceutical companies, and drug regulation and pharmaceutical policy in the United States after World War II. Her other work has focused on the role of academic and government researchers, biotechnology companies, and disease-based organizations in the development of drugs to treat rare diseases, so-called orphan drugs, and she has a continuing interest in post-war developments in academic medicine and in health policy. Dominique will take the lead in conducting interviews over the next several years and will work closely with the History Project to make sure the interview recordings and transcripts are made available for research through the archives. So, if Dominique contacts you and asks you to share your story, please step up to the microphone, for history’s sake. Dr. N. L. Gault, or Neal to just about everyone he met, passed away on December 11. Dr. Gault was Dean Emeritus of the Medical School and Professor Emeritus of Medicine. 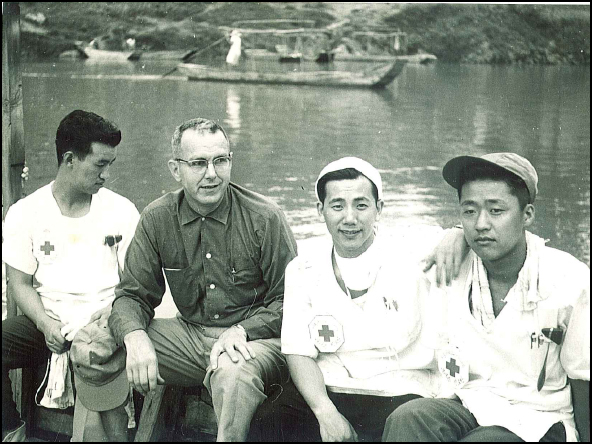 Dr. Gault’s medical education began in Texas, brought him to Minnesota, and then took him on a world wide tour that included Korea, Okinawa, China, New Delhi, and then landed him for a short time as the Associate Dean for the University of Hawaii School of Medicine. 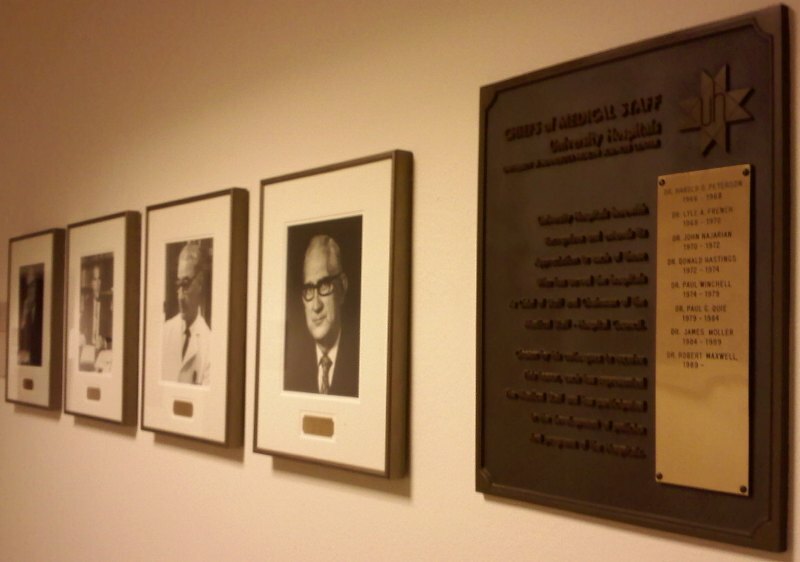 In 1972, Dr. Gault returned to Minnesota and served as dean for the Medical School until 1984. Dr. Gault served as dean during the expansion of the health sciences in the 1970s and early 1980s. It was once said that he lead a major expansion both physical and functional of the Medical School at a time when every basic resource was in full retreat. After completing his service as dean, Dr. Gault continued to be active at the University as a special staff to the Vice President for Health Sciences and as an advocate for the Minnesota Medical Foundation and Medical School alumni. He also maintained his international interests by serving as the Honorary Consul General of Japan for Minnesota. I had the opportunity to meet with Dr. Gault several times over the past few years. He was well aware of the role of archives and the importance of preserving the historical record. Even during his tenure as dean, Dr. Gault personally and diligently transferred office records from the Medical School to the archives. I told him that his attention to record keeping must have been a result of his early training at Adjutant General School for the Air Force (after serving as Adjutant for a 1,000 bed hospital during the war at the age of 23). Whenever Dr. Gault was asked what propelled him from rural Texas to an internationally renowned medical education specialist, he consistently answered that it was the opportunity for an education that he found at the University of Minnesota. The halls of the Mayo Memorial Building seem to have little bits of history scattered throughout. There is a plaque here, a picture there, and even the occasional bronze bust. University Hospitals herewith recognizes and extends its appreciation to each of those who has served the hospitals as Chief of Staff and Chairman of the Medical Staff – Hospital Council. Chosen by his colleagues to receive this honor, each has represented the Medical Staff and has participated in the development of policies and programs of the Hospitals. And there the list ends. Somewhere in the middle of Dr. Maxwell’s term with plenty of room left on the brass plate. Did the administrative offices connected with the plaque move shortly after the 1989 addition of Dr. Maxwell and then leave it behind? Did Dr. Maxwell serve until the transfer of the hospitals to Fairview in 1996? Did Dr. Maxwell finish his tenure but never replaced? Questions I have yet to answer. The last time I went to the doctor, I noticed that the prescription pad was quickly becoming a thing of the past. The doctors and pharmacists I interacted with relied primarily on Web based forms, direct faxes, and large pharmaceutical databases to provide the prescriptions and information I needed. What did we do before this online convenience? One option was to pick up the telephone and call the College of Pharmacy. The College of Pharmacy provided a public information service for questions related to prescription drugs. Inquiries came in through letters and telephone calls and often sought the composition of pharmaceuticals, translations of foreign prescriptions, and general advice on the interpretation of prescriptions. Most questions came from local pharmacists; however, some were from the general public. At times the information service attracted people passing along employment information and even a solicitation from one pharmacist wanting to sell his business. 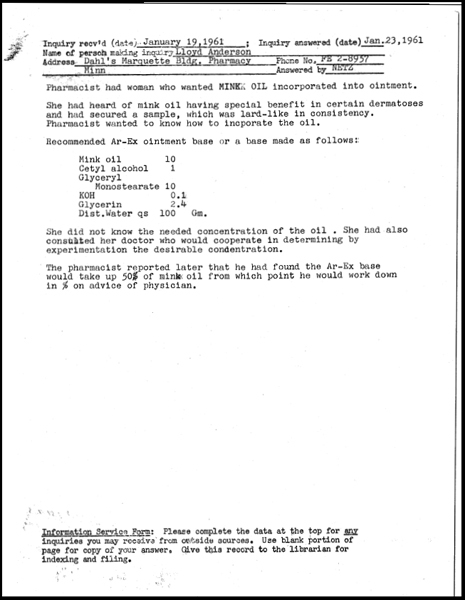 From the late 1950s through the early 1960s, Charles Netz, professor of pharmaceutical technology, provided most of the responses. Each answer was usually typed out and given to the pharmacy librarian for filing. In addition to his duties of teaching and providing pharmaceutical reference information, Netz also served as president of the Minnesota Pharmaceutical Association in 1950, associate dean for the College of Pharmacy beginning in 1960, and acting dean in 1966. He also authored the History of the University of Minnesota College of Pharmacy, 1892-1970. Netz was a member of the faculty from 1918 until retiring in 1966. View selected responses to questions for the College’s information service from 1961 below. Topics include questions on mink oil in an ointment, confirming a prescription for Sodium Phenobarbital, an attempt to identify a prescription from Poland, and a pharmacist looking to sell his business.